To get the best Property Management in Bulgaria, it is important to find a reliable company who understand and share your standards and expectations in the most cost-effective way to ensure your foreign home or investment is looked after. You have probably noticed the toll that extreme temperatures of hot summers followed by cold winters takes on Bulgarian roads! Since we have been in Bulgaria we have experienced winter temperatures of -28°c with hurricanes raged for several days. Yet in the height of summer temperatures can approach 40°c. Your property is also exposed to these elements, so it is important that your Bulgarian Property Management company monitors external areas (roof, rendering, paths etc.) as penetrating water can freeze, causing cracks and other damage. During the winter unattended properties must have the plumbing system drained to prevent ice breaking pipes, boilers, toilets, taps and even washing machines. Particularly with property management in Bulgaria, it is important to entrust this responsibility to the right people, as the cultural differences can be immense. During communist times it was normal to share facilities, and many people still think this way. So leaving your keys with a neighbour might be a cheaper option, but they might well take advantage of your amenities when you are gone. Similarly, without property management in Bulgaria, an empty property can become a target for the most unexpected types of theft. We have met people who have found their house stripped not only of contents, but even bricks, windows and wiring. Bulgarians usually blame this on Gypsies, but whoever is to blame it is true that properties are only usually targeted when there are signs that the property has been left unattended for long periods of time. Build quality here is often not anywhere near UK standard, and the same is true of plumbing and electrical fittings. Our team make sure that any repairs are carried out with quality components, and that you are charged Bulgarian prices for work! Owning a home places many obligations on you - you will need to register to pay your taxes, electricity and water bills, and you may also have television and telephone connections to think about. Registering these in Bulgaria cannot be done by phone or post, but part of our property management in Bulgaria is to arrange to transfer accounts into your name and ensure the bills are paid on your behalf. Our team will find a solution to just about any problem you might have with regard to property management in Bulgaria, so you won't waste your own valuable time worrying about it or running around needlessly. 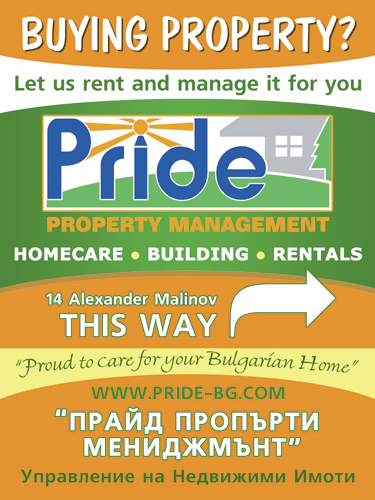 Our British managers are residents in Bulgaria and are always on hand if you have any concerns, so trust us when we say we will be Proud to care for your Bulgarian home!